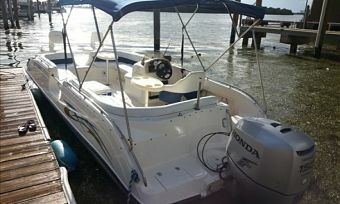 There are many factors involved in selecting the right boat. With countless combinations including amenities, design, model, size, and price range, determining engine preference for power boat users is critical. Two power options to consider for smaller recreational boating are the jet drive engine or the sterndrive engine. Each comes with a set of pros and cons that a skipper should consider when making a vessel selection. This power source propels a boat by a jet of water ejected from the back of the vessel. It delivers a high-pressure "push" from the stern of a vessel by accelerating a volume of water as it passes through a specialized pump mounted above the waterline inside the boat hull. 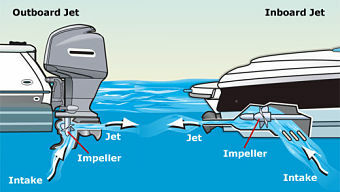 The expelled water through a nozzle at the stern creates the propulsion. Without propellers, there is no need to trim an outdrive unit in shallow water. Very little draft allows for shallow water exploration and beaching. In shallow water, small stones, debris, and weeds can easily be sucked up into unit. No whirling blades to cut or severely injure swimmers or marine wildlife offer the greatest safety. Good for pulling tubers, but typically too little torque for pulling waterskiers. Quick turns and speed make for a thrilling ride. Tight turning without experience can easily cause the vessel to spin out of control on tight turns in choppy water. There is a low rise on the bow to achieve plane. More open design for seating aft with no need for a sun-pad to house engine. No true neutral — when the engine is on, it is thrusting and engaged. Poor steering at low speeds and loss of control when backing off of throttles. The engine is always pumping water and therefore always engaged. Fewer moving mechanical parts and a simpler design can lead to less maintenance and repair. The drive shaft leaves the engine and directly spins the impeller. Special model specific oil is recommended. Fewer mechanics work on jet drives versus sterndrives, which can lead to more expensive maintenance and repair. Salt water difficulties include higher rates of internal corrosion and aquatic growth on tight impeller clearance tolerance. More power is required to go the same speed as a sterndrive because the thrusting mechanism is not as efficient. 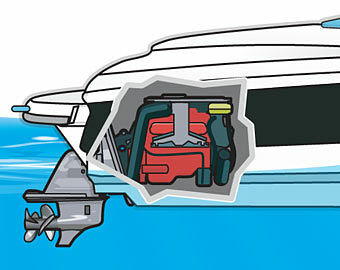 This power source uses a conventional screw propeller in the water below a boat hull connected to an interior engine unit. They effectively "screw" through the water to drive a vessel forward by generating a difference in pressure between the forward and rear surfaces of the propeller blades and by accelerating a mass of water rearward. Sterndrives are a four-stroke automotive engine adapted for marine use and also known as inboard/outboards (I/Os). They are attached through the transom to a drive unit (also called an "outdrive") that turn the propeller at the other end. Greater steering control at all speeds. Drive offers forward, neutral, and reverse which can make for easier handling (when docking for instance). The propeller can be stopped for a true neutral and ability to idle. The outdrive unit can be adjusted or “trimmed” for shallow water by lifting and securing the propeller shaft in a higher position either manually or with power trim if the vessel offers that option. Superior at navigating weed beds by cutting through them. Spinning prop blades create a risk for swimmer and marine life injuries. Good for pulling all watersport activities such as tubes, water skis, wake-boards, and other water equipment. Aft design offers a large sun-pad that covers the engine. Deep-V cut hull creates a more stable ride. High rise in bow to achieve plane. The outdrive swivels like an outboard engine to direct propeller thrust and direction. Typically get better fuel economy. Experienced sterndrive mechanics are widely available which can lessen the time and expense of maintenance and repairs. Unit can more easily be flushed and cleaned after salt water use, lessening corrosion and aquatic growth on drive unit. Among the many factors that contribute to selecting a vessel, power should be a top consideration. When choosing between a jet drive and sterndrive engine, the mechanics of how a boat is powered influences many things such as agility and control, maintenance and repair, and the nature of use. Researching information and talking to other captains can help make the right choice for you. Take a look at our other articles for tips on troubleshooting an engine’s electrical problems, fixing drowned outboard engines, and more.